The connection between connective learning (connectivism, if you will) and complexity was, I think, obvious from the start. 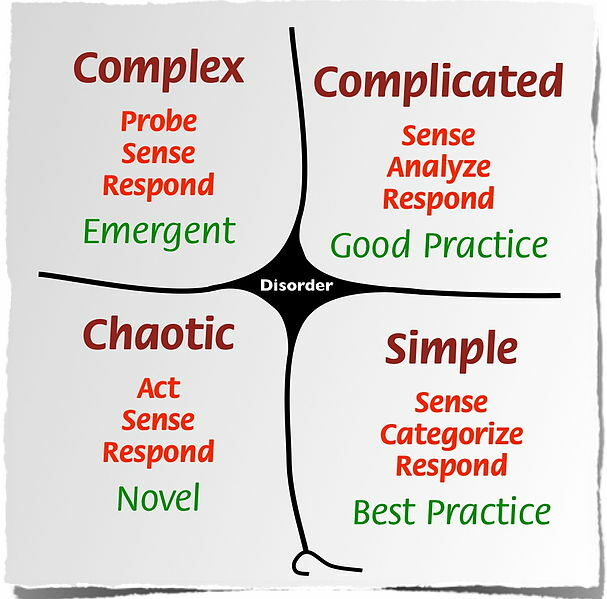 I seem to recall encountering the Cynefin framework very early on in connectivism explorations– perhaps even as a session in CCK08? And it became equally obvious that, as one begins to try to explain the whole connective learning thing to others, complexity has to be part of the conversation. 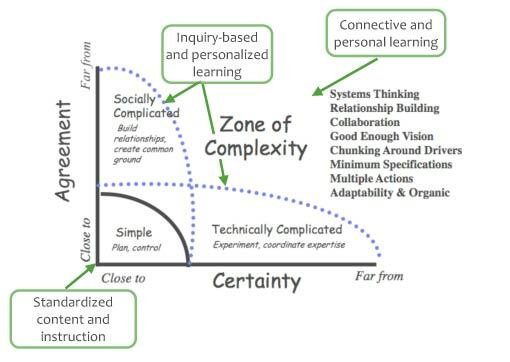 So as I catch up on some reading and see that Dave Cormier has mashed up rhizomes, connective learning, and the Cynefin framework, it makes perfect sense to me. Except, I discovered a while back, apparently it doesn’t make total sense to others. In fact, I used the very same illustration Dave did in a presentation about implications of connectivism shortly after the conclusion of CCK08. And I wound up with the impression that it left the wrong impression. Not because the framework was wrong. Or that the presenter—then or now:-)– was wrong (although perhaps my powers of explanation or lack thereof may have played a role), but simply because the graphic didn’t lend itself as well to a conversation about learning as well as it did to a conversation about problem-solving. Don’t get me wrong—“real” learning in my mind is ALL about problems and trying to solve them. And as I understand it, considerations of rhizomatic learning are related to but not the same as connectivism, so perhaps relevance is in question. But I offer my experience as an alternative perspective with the thought that maybe it’s a shortcut for anyone who wants to go this direction. The deal with the Cynefin graphic in this permutation is that it seems to get interpreted as bins for sorting things into, kind of like when you go to Ikea in hopes of solving your household storage problems. And the result seemed to be that people walked out with the idea that complex learning concerns are best (or could be) isolated in one corner and addressed with the best practice of not using best practices. Which, you know, seemed kinda wrong. I admit to some trepidation about the somewhat implicitly progressive implications of such a graphic, which, worse case scenario, gets interpreted as a kind of “how wild and crazy are you” challenge. But I have found it works well in exploring people’s comfort zones and even worldviews. Do you sincerely believe that most things can be planned and the future reasonably accounted for? Then here’s a zone of understanding where perhaps only the outside edges are fuzzy. But maybe other folks don’t think that way. So here’s an idea of where they might reside and perhaps a few words describing how they think, and maybe there are some blurry lines you could share. It has been useful for seeing learning as not just about outcomes, categories and choices, but about processes, options, and opportunities. Hi Carmen, I really like these graphics. Your use of scales and continuums instead of the baskets of Ikea /Cynefin makes a great difference for me. The graphics could be used to show the limitations of standard testing of student outcomes. We could use the graphic to illustrate learning and teaching. Only in the left corner “Simple (learning)” standard testing and standard assessment could be useful. 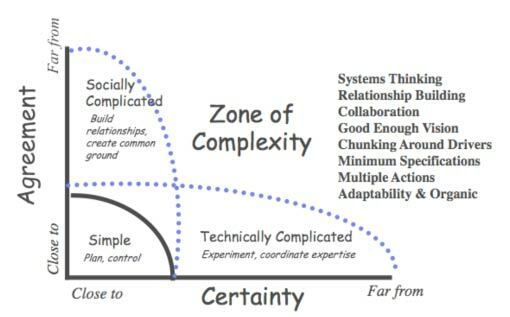 In the “Zone of Complexity” assessment is more difficult and complicated. 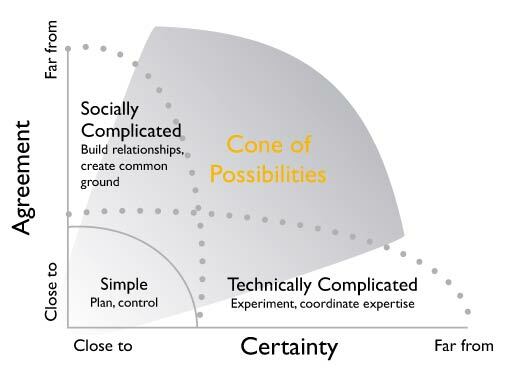 Love the final graphic and the Cone of Possibilities. The further we head to the upper right on the chart the more intense the negotiations over certainty become. “Knowing” stops being so clear and final, things come to life here that might exceed safe limits of exposure. Placing yourself in a position of having to explain / defend your beliefs is exhausting but also a source of continual inspiration. The image of potential bubbling away in the cone is very clear in the graph. Thanks for this. In complex learning the cycle of the Complex part of the cynefin framework seems to be a method to test complex knowledge and skills. In that cycle is a mix of learning, application of learned lessons and proof of mastery. @Scott: Love the inclusion of the word “potential” in your comment– thinking maybe it needs to replace or be added to “possibilities” in the cone. And “negotiations” are indeed significant to understanding this, as I tend to see this graph as being as least as much about brokering between worldviews and beliefs as it is about learning “stuff.” Thanks for the vocabulary expansion! @Jaap That word “cycle” is also important. I think you’ve captured that sense in complexity where the learning, skills, application and demonstration of mastery occur in such rapid iteration that it’s hard to tell where one starts and and one stops.